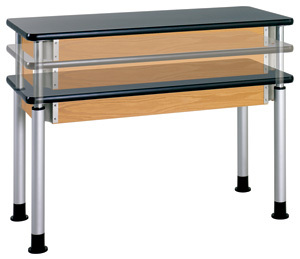 Diversified’s Adjustable Height Science Table is a perfect solution for ADA requirements with the ability to adjust in 2 cm increments from 27"H to 39"H. The adjustable height table can also be adjusted for use as an incline surface for physics. Solid 4-1/2" oak aprons are attached to your choice of three top options. The wood is finished with a chemical resistant, earth-friendly UV finish. Optional casters sold separately.